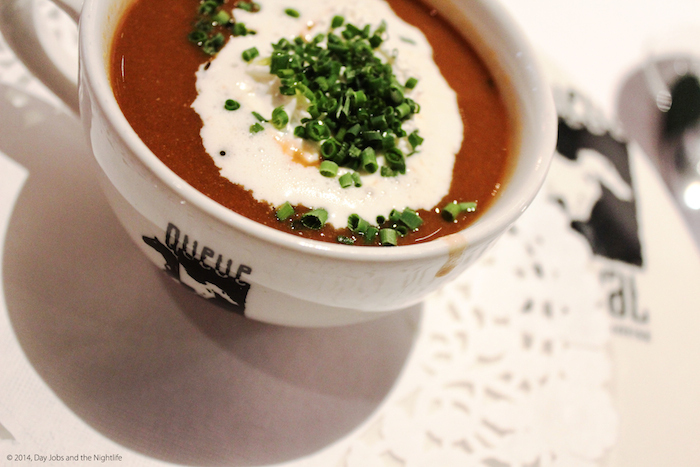 After a much lamented absence, Queue de Cheval is back. About a month ago, the restaurant reopened, in a new, entirely revamped location, returning to its prominent place atop the lists of foodies in this city and beyond. At the beginning of the summer we were among the first to get a peek at what was going on (literally) behind the scene of the new Q. We delivered, to you, our adventurous visit to the alley behind Queue de Cheval where we enjoyed a fantastic QDC Burger. This past weekend we finally stepped inside the restaurant’s new location and sat down for a sampling of their lunch menu. Much like our experience at QDC Burger, our expectations were obliterated. When we walked in for lunch, the owner, Peter Morentzos was standing near the doorway with a couple of staff members, warmly greeting hungry Montrealers, most of them by name. We were barely over the threshold when he saw us and smiled, “I recognize you two,” he said, his distinct voice, registering around baritone. We chatted quickly about everything from his new haircut to how I am jokingly taking credit for the success of QDC Burger (that got a boisterous laugh out of him). After a few minutes we were ushered to a lush table along the south wall, near the lofty kitchen. A team of dapperly dressed waiters made sure we were comfortable and one of them explained the lunch menu in detail. The three-course lunch menu is quite extensive and the waiter’s explanation made everything sound like the best thing on the menu. 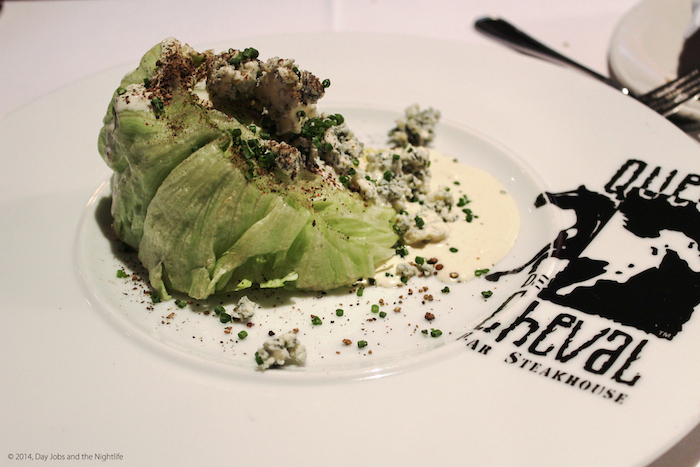 After a few minutes I chose the creamy blue cheese drenched wedge salad (pictured above) and my partner opted for the smoky lobster bisque (pictured above). Both portions were perfectly sized and tasted wonderful, setting the scene for what was about to come. For our main course we ordered the steak frites (pictured above) and the angry lobster papardelle (also pictured above). Both dishes came out of the efficient kitchen very quickly. 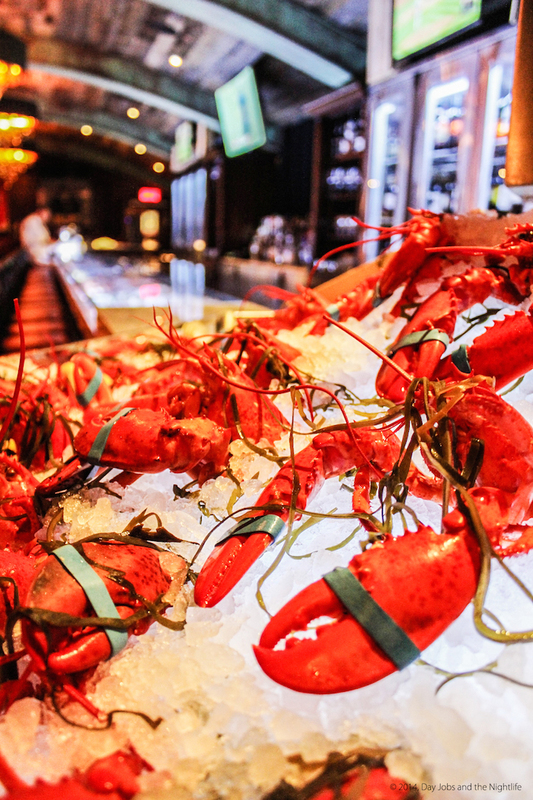 My stomach was growling as I swiftly cut into the meat while my lunch partner wasted no time delving into his steaming plate of lobster and pasta. I’ve eaten many steaks in my life but this one was a perfectly seasoned and tender cut of mouth-watering beef, served with a creamy béarnaise sauce and some fantastic, piping hot fries. The portion was perfect for lunch and left me wishing for more. On the other side of the table, my partner’s lobster pasta was spicy and full of flavor. At the end of the meal, both plates were left almost clean. 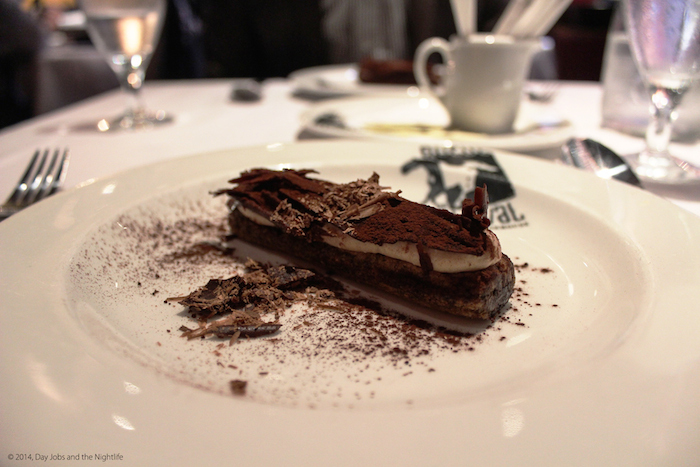 The indulgent dessert was a creamy tiramisu covered with powdered chocolate (pictured above). Although we tried to savour it as much as possible, the dessert was gone faster than it arrived. 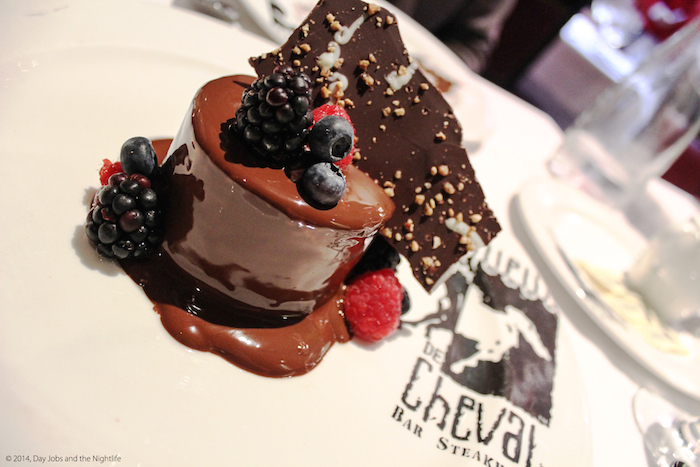 We thought it was going to be the perfect punctuation to the meal but Queue de Cheval had other plans for us. As our pants were feeling the stretch of another great meal, the wait staff brought us a very special treat; a perfectly named Killer Cheesecake (pictured below). We were told that people reserve at the Q just so they can have this dessert and I don’t blame them. My mouth was agape as the dessert touched down on the table; a creamy cheesecake drizzled in glistening warm chocolate and fruit. The waiters took joy in our expressions, knowing quite well that without a doubt we would enjoy ourselves. We started off with civilized wedges but seconds later we were devouring the dessert and if I had been any less civilized I would have licked the plate. No joke, it was that good. 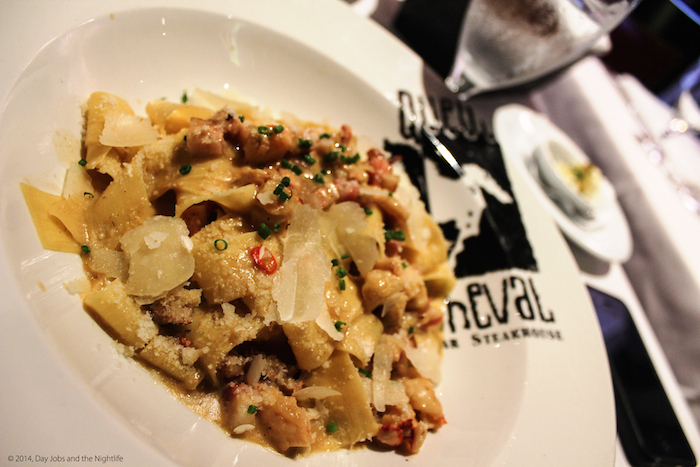 Queue de Cheval is a next level dining experience in Montreal. The quality of the food is among the best you can expect but on top of that, at night, Mr. Morentzos stands by the kitchen as plates come out and he checks that each one meets his standards of perfection. If it isn’t perfect, it goes back. His dedication to the restaurant and the people who entrust him with their business lunches, wedding anniversaries or even a simple meal before a Canadiens game will not be disappointed. On top of his perfectionism, Peter is an engaging personality who’s never too busy to say hi and shake your hand. 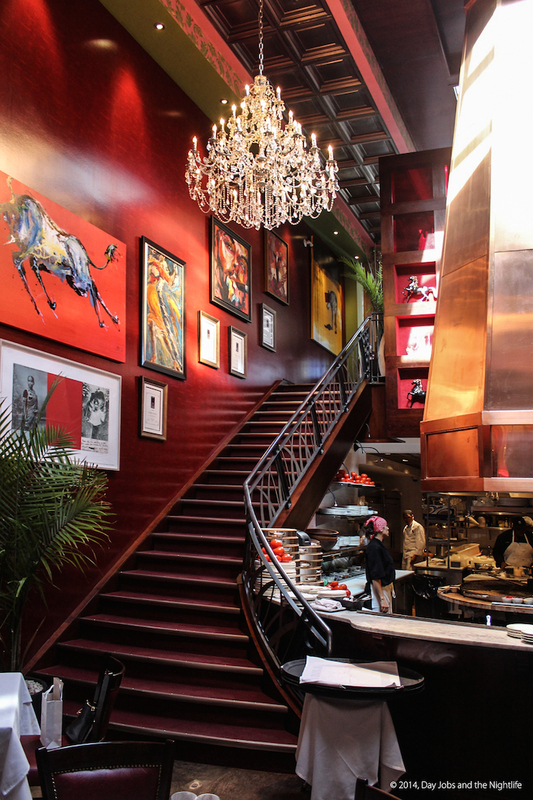 Everything about Queue de Cheval is centered on our enjoyment and no stone is left unturned in providing a world-class experience to anyone who passes through the restaurant’s doors. After the meal we were given a tour of the restaurant’s many levels by one of Queue de Cheval’s most loyal employees, Max. When construction was underway on the new Q, they gutted out the entire building to create this new experience. What they have come up with in the end is a decadent, art-covered atmosphere, complete with an opulent copper fume hood that hovers over the open kitchen. From the waiters to the kitchen crew, each staff member gets to part of the action they help create. Upstairs there are two more dining areas that can be used for private functions and an impressive wine cellar that can hold up to 10,000 bottles of wine. 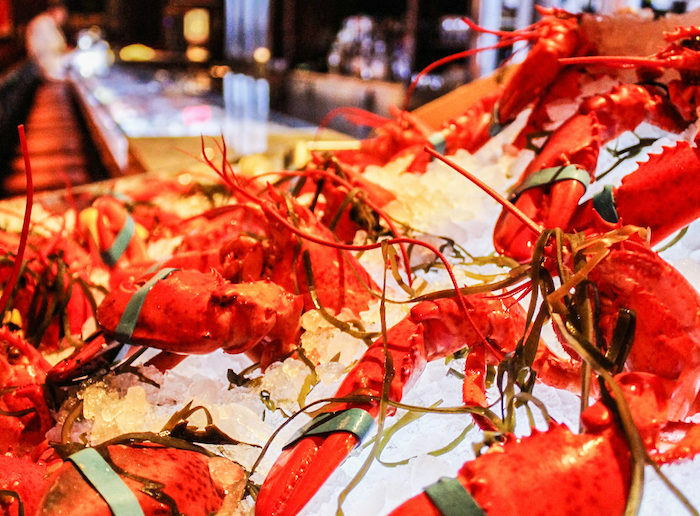 Below the main level of Queue de Cheval we find the Angry Lobster, a full seafood restaurant and bar where you can order just about any cocktail or glass of wine imaginable. The cigar aficionados will be able to enjoy their cigars on this level as well. 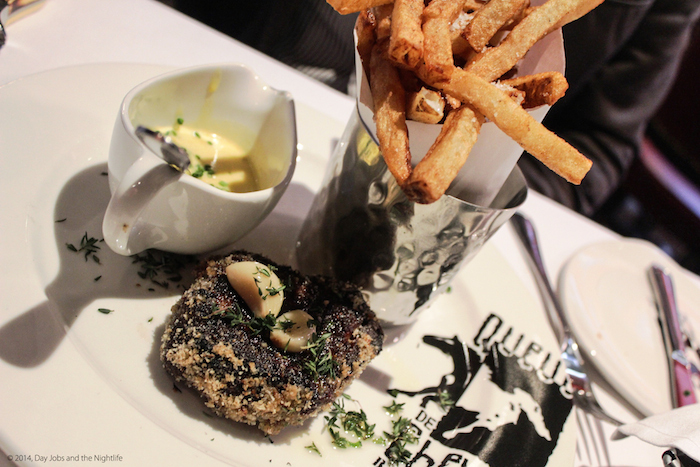 The new Queue de Cheval is an altogether unique experience in Montreal. 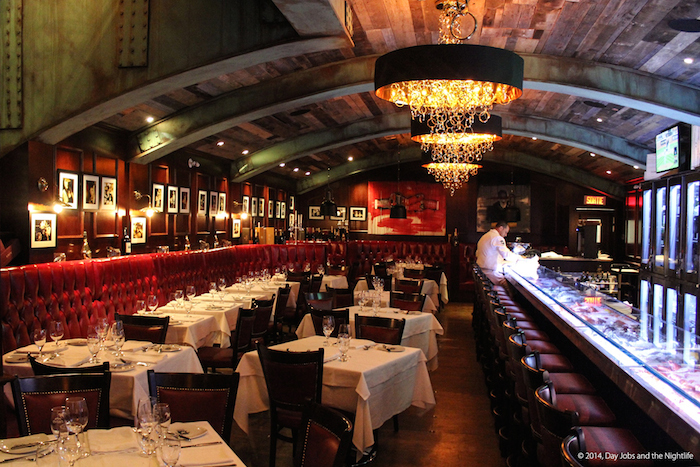 Their down to Earth approach to providing a first class experience to people who have come to expect a certain theatricality to their dining experience are not just their for the meal, they are back for the show.